FINISH: Without doubt, our favourite project to date. This finish has a lot of details that we absolutely love. The IRIS team were kind enough to give us a great deal of freedom on this project. 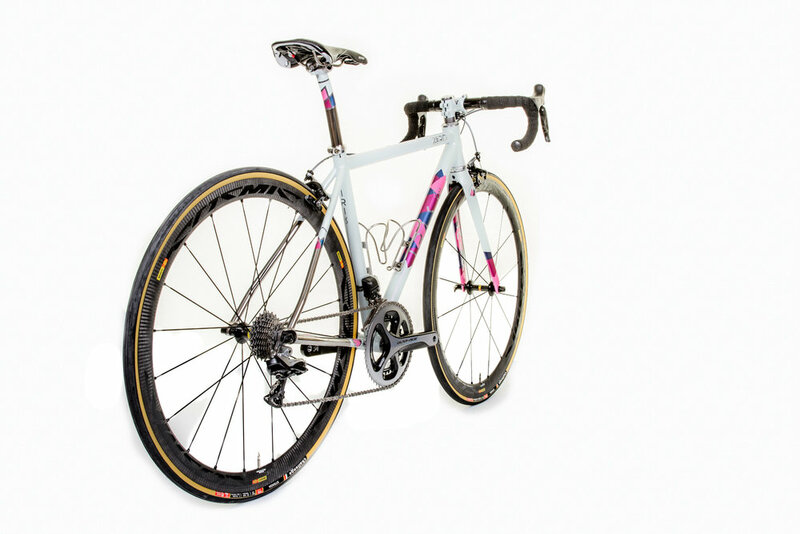 We worked with them on the colour palette and a loose sketch but effectively, we were able to craft the whole feel of this bike; their brand’s debut. As a general rule, we’re not into two-dimensional finishes. We want to reward viewers with extras for getting up close, inspecting the details and approaching from different angles. 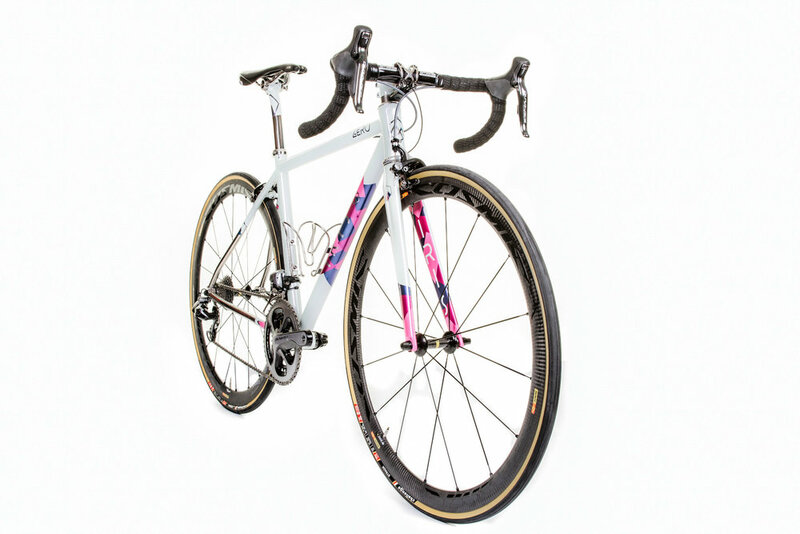 The first part of this is evident in the paint choices here; some flat colours and some with varying degrees of metallics to give different reflective dynamics; an off-white pine taken from the British Standard range to reference the British history of titanium and finally a purple pearl over the entire bike to just give it that extra special something. 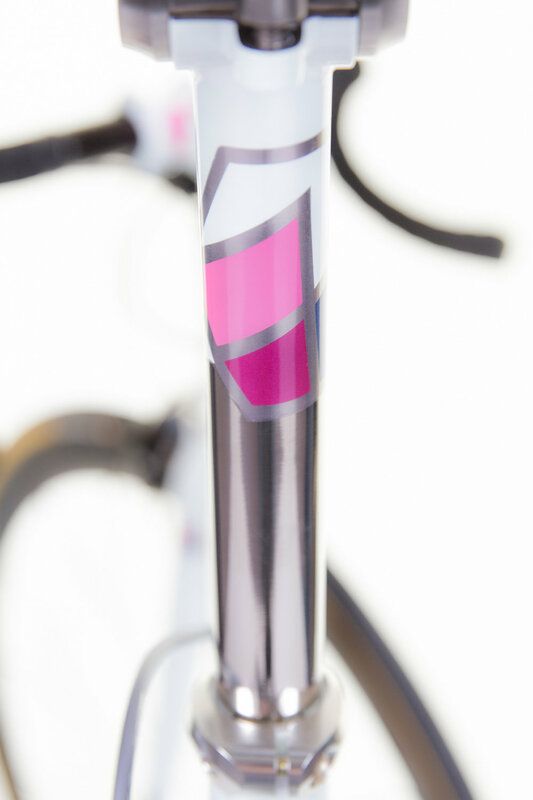 We developed a new priming process to allow us to highlight the titanium substrate through exposed graphics in the branding on the down tube, top tube and hidden at the rear of the seat tube. All the while remaining undetectable to the touch. The interlocking and overlapping block pattern that features throughout the design utilises the polygon shapes found in the IRIS mountain range logo. This flourish is even evident on the stem and seat post. Our favourite iteration is probably from the inside of the fork blades. As the colours and shapes clash and interact, they burst out of the fork and continue to wrap around the outer sides of the blades. This has become some what of a house signature. A further feature on the fork is he IRIS logotype on the inside of the non-driveside blade, perfectly framed when the bike is built up. 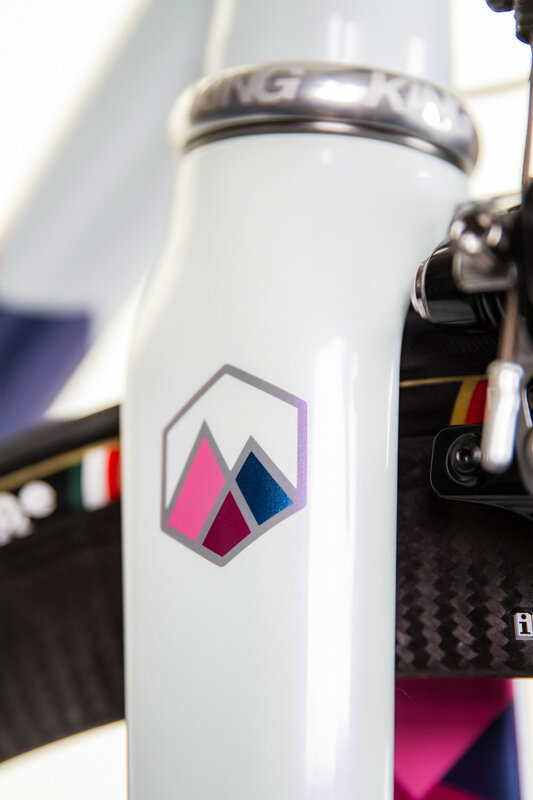 The last element of the already complex fork is the four colour airbrushed logo acting as a swatch reference for every colour featured on the bike. 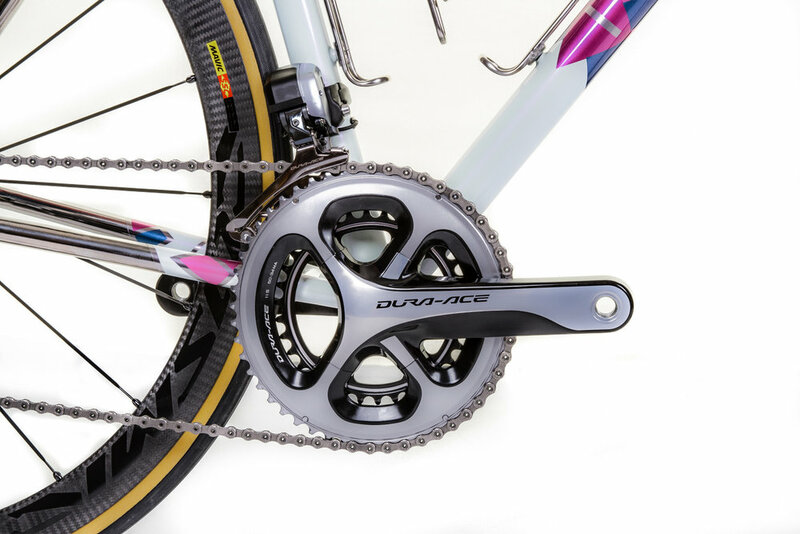 The rear stays have been left completely exposed to allow the polished Ti to be the main attraction. The transitional junctions from colour to raw feature four different asymmetrical inverted versions of the IRIS logo shapes, which in turn wrap and meet seamlessly around the tubing whilst hosting an exposed Ti border acting as a bridge from colour to raw metal. Even with all this going on, the cool off-white of the main body keeps the whole thing in check making for a clean, high-end bike.